The town of Cognac lies 250 miles Southwest of Paris along the Charente River, and a 90 minute drive from the nearest airport in Bordeaux. A charming town, Cognac is lined with narrow cobbled streets and elegant historic buildings as well as being the home to its world-famous, eponymous spirit. The Cognac industry has a strong presence in the region with many Cognac Houses in the town's centre and suburbs. One of these is Martell, the oldest Cognac House, established in 1715 by Jean Martell, an Englishman from Jersey. By 1721, Jean-Martell was exporting over 200,000 litres of cognac in casks to England. After the French Revolution, Martell became the official suppliers to Napoleon Bonaparte, and during World War II Martell supplied Winston Churchill. 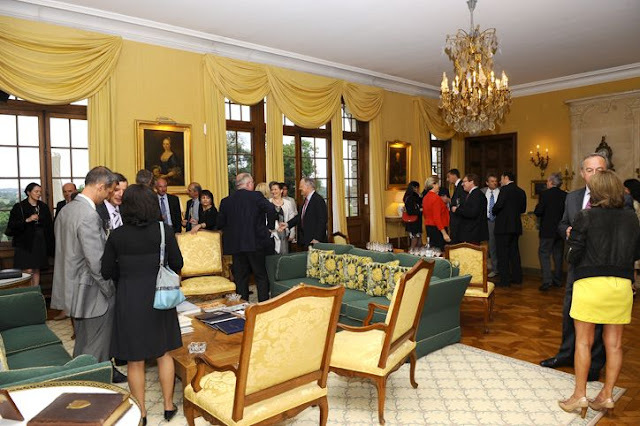 There is a strong, historical connection between the various Cognac Houses in this region and the British, much akin to the Port Houses in Portugal. In addition to Britain being the most important export market at the time, it is also thought that the knowledge of whisky distillation brought in by the Brits was instrumental to the development of the Cognac industry in its early days, although it probably would not please the French to hear me saying this! Unlike whisky which is made from grains (barley), cognac is made from grapes, primarily Ugni Blanc (or Trebbiano in Italian) which must make up at least 90% of its blend. It takes 6 to 10 litres of wine to make a 70cl bottle of cognac which is then aged for at least 2 years in French oak barrels. Martell VS is the entry level of Martell's Cognac range, aged for 2 years, it is smooth, fresh and light making it ideal as a base for long drinks and cocktails. I loved "Martell Sidecar" a delicious drink of 2cl Martell Cognac, 10cl sparkling soft drink (either soda water, ginger ale, tonic water or lemonade - I had it with tonic water) and a few ice cubes. Another favourite was "Martell & Ginger" - made simply from 35ml Martell Cognac, ginger ale and a lemon wedge. I had never thought of cognac as a base for cocktails, but was happy to find a new spirit to add to my cocktail 'can-do' list. I was invited to the Martell Distillery and their Château earlier this month to accompany a group of competition winners who had won a fabulous trip to Cognac, all expenses paid, and to take part in the "Martell Very Special Nights" event. This was an intimate event for selected guests that took place at Martell's Château de Chanteloup with a live performance by none other than Jamie Cullum, followed by dinner designed by Raymond Blanc (and brilliantly delivered by Adam Johnson). The event was planned as part of the Cognac Blues Passions Festival that takes place every year. The hugely popular Blues festival of which Martell is a major sponsor, draws in audiences and musicians from all corners of the world including continental Europe, US, Britain and Japan. The town is transformed with live Blues and Jazz bands playing at many of the town's squares and open spaces, and the thousands of visitors arriving in Cognac made for a real party atmosphere. I was the only press member on the trip, and was excited to have been invited to report on the occasion. 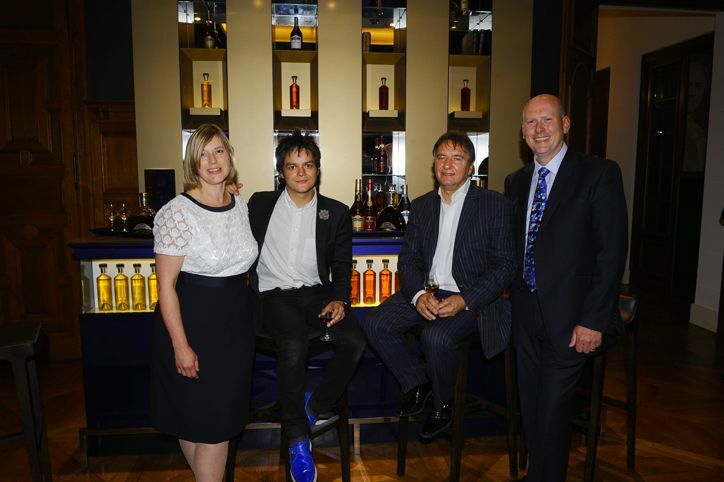 I was also sincerely touched to see the care and effort that the Martell and M&C Saatchi teams put into making those 3 days, indeed 'very special' for the competition winners. Flying into Bordeaux, we were transferred to the magnificent Château de Chanteloup just in time for lunch. Château de Chanteloup, a 16th Century home and country retreat, was first acquired by Theodore Martell in 1828 and remained within the Martell family until 1962. The then owner, Maurice Firino-Martell re-built the Château in a Norman style, as a gift to his wife Elisabeth who missed her native Normandy. 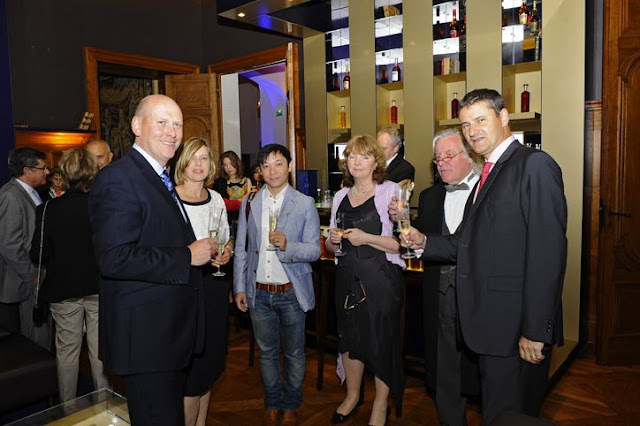 It now belongs to the Pernod Ricard Group, owner of the Martell brand, and is used as an exclusive guest house for Martell's VIPs, but is sadly not open to the public. Lunch at the Château was a very good start to the trip - we started with a platter of sweet melon and charcuterie followed by pan-fried fillet steak served with a deliciously rich red wine and beef jus, and potatoes deep-fried in duck fat, which were incredibly decadent but so delicious! Beef fillet and chips deep-fried in duck fat! Sublime. The 1993 Château Brane Cantenac Margaux was a great match for the steak and posh chips, followed by scrumptious dessert of cherries poached in wine, served with caramel, pistachios and chocolate. The competition winners with whom I spent the next three days were Mary Gomm and Tony Fey, two publicans from Bristol and Devon, and Richard and Claire Pearson, a former Sainsbury's store manager who now works in logistics and his wife, a senior teaching assistant. I enjoyed chatting and spending time with them. Tom is a keen art and antique collector, one of my major interests after food and wine. Talking to Mary, it was fascinating to learn about the life of a publican, its highs and lows. Richard and Claire are real Martell enthusiasts, Richard even had a Martell fireplace built at their home! Joining the group was also Adam Johnson, the development Chef for Raymond Blanc who was in charge of the meal we were to enjoy at "Martell Very Special Nights" event. 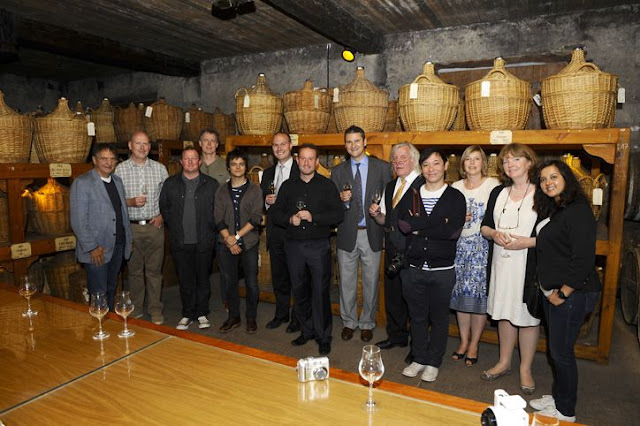 We all headed off to the Château's cellar for a tasting of Martell Chanteloup Perspective, a relatively new label launched in Beijing and retailing at around £345 per bottle. This is not surprising, considering that 1 out of 2 bottles of Martell is now sold in China. Back to the Château and on to dinner - we started with a lovely and generous piece of foie gras followed by a pan-fried fillet of sea bass served with a vegetable tian and pistou dressing. These were both delicious, and went down particularly well with a bottle of 1988 Château Calon-Sègur, St Estephe. For dessert, we had a chocolate tart served with ice cream before moving on to the bar for a few Martell cocktails. An early flight, two wonderful meals and plenty of cognac started to take its toll - I went to bed sometime after midnight but I heard some our group were sipping their Martell cocktails until the very early hours. Next morning, we visited Martell's vineyards and distillery and had a Cognac tasting at 10am! I had touched on spirits and the distillation process during my studies at the WSET, but it was fascinating to be able to see the real thing first hand. We were given a detailed explanation of how Martell carefully selects very specific crus from within the Cognac region or AOC and in particular from the four main crus, including Grand Champagne and Petite Champagne, Fins Bois and the Borderies. Martell also uses a strict double-distillation method and aging process, using clear wines with no lees (sediment), producing a purer and lighter liquid eau-de-vie. The eau-de-vie is aged by Martell in fine-grain oak casks, giving it its beautiful amber colouring. The eau-de-vie stored in these fine-grain oak casks takes on a more delicate aroma as it ages since the tannins within finer oak are much subtler than the intense tannins of coarse-grain oak casks. As the eau-de-vie matures, it develops its character and the age of the cask (new, medium-old and very old) will determine that process, along with the quality of the wood and time of maturation. We also visited the Leroi Cooperage, to see the fascinating process of artisan barrel making. Martell's are hand-made from French oak, and only lightly toasted. Lunch at the famous Bistro de Claude was another highlight of the trip. This is the most reputable restaurant in town. I started off with an extremely generous serving of foie gras on toast, followed by a medium-rare rib eye steak and pommes frites. For dessert, the crème brulée was too much of temptation to resist, and that's what I ordered. The meal was faultless. It is a small restaurant and was completely full as we arrived - booking is essential. The Martell Distillery and Visitor Centre is in the centre of Cognac, and is also home to the Founder's House built by Jean Martell in 1728. Visitors to the Martell HQ can still visit this house, now a museum, which lies in the centre of the warehouses and other Martell buildings which have been built around it over the centuries. Jean Martell's archives are also to be found here, and it is a fascinating collection of letters and invoices exchanged with his customers, including European monarchs and US presidents, dating from the early 18th century. 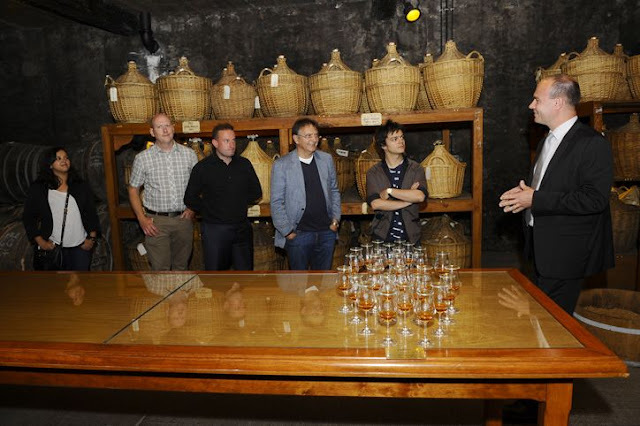 The Paradis cellar is where Martell keep their exceptional eaux-de-vie, some dating back to the early 1800s. They are stored in demijohns, and are used exclusively for blending 'Extra' cognacs sold under the Creation Grand Extra label which may cost hundreds or even thousands of pounds. We had an amazing tasting with Benoît Fil, the cellar master, which included eaux-de-vie from 1875 and 1848. I still haven't come to terms with the fact that I drank something made over 160 years ago, and it still had a wonderfully rich and complex palate! 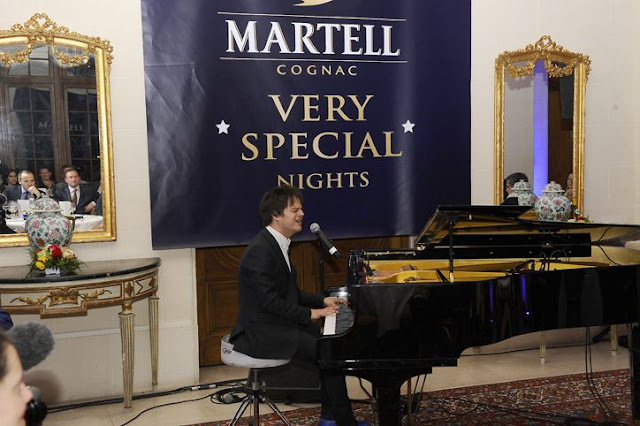 It was then back to Château de Chanteloup for what everyone had been waiting for - Martell Very Special Nights event. The Château's huge entrance hall had been turned into a magnificent dining area with tables beautifully laid out and scattered around the grand piano. 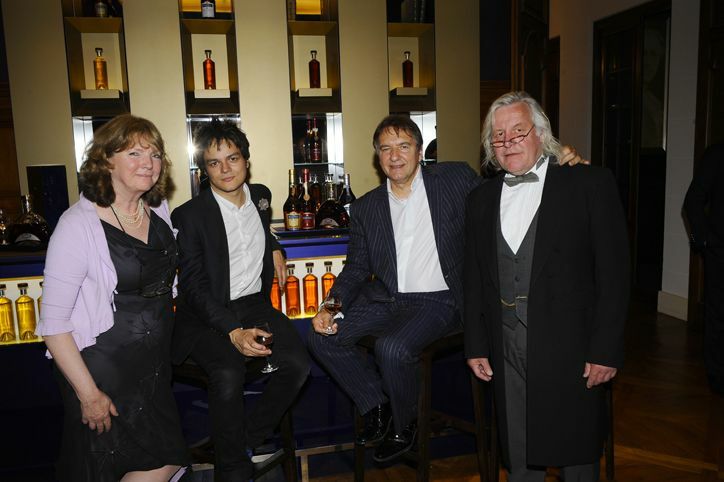 The evening started with a performance by Jamie Cullum, which was nothing short of outstanding. He began singing a capella, walking casually down the grand stairway while clicking his fingers and stamping his feet, with no other musical accompaniment. It was a fantastic entrance, and an original start to his show that evening. Jamie's stage presence was mesmerising, and his improvisation as he sang kept us all guessing during his 45 minute show. He performed a mixture of new and old songs, including his jazzy re-interpretation of Rihanna's Diamonds. 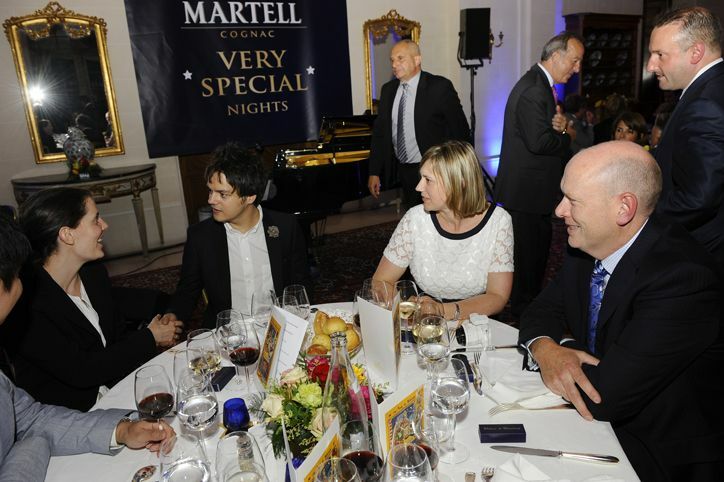 For Martell's Very Special Nights dinner, the menu was created by Raymond Blanc and delivered by his development chef Adam Johnson. Following an aperitif glass of Perrier Jouët champagne we started with Essence de Tomate, a wonderfully concentrated clear tomato extract. Next was Spiced Aubergine, with Chickpeas, with Confit of Lemon served with a glass of crisp St Aubin 2009. The flesh of the aubergine had a lovely charred flavour, and the combination with creamy chickpea was unusual but apt. For main course, we had Roast Limousin Lamb, with Spring Vegetables. Soft and expertly cooked, the serving included a cutlet, a sweetbread and a slow-braised cut of shoulder which Adam had cooked overnight, well partnered with a fine Chateau Talbot 1986. 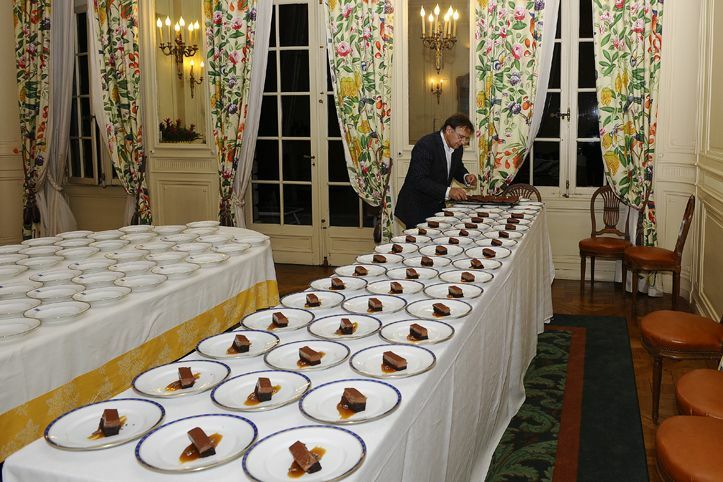 Dessert was Marquise au Chocolat, with Praline Ice cream and Lemon Caramel Sauce. The dessert was served with a glass of Martell Cordon Bleu. It is always difficult to match alcoholic drinks with chocolate, but I thought the Cognac worked really well with it, each balancing the weight and richness of the other. Finally we had a selection of seasonal berries, lightly macerated in Cabernet wine, with fresh mint, basil and a generous splash of Perrier Jouët rosé. A refreshing, palate-cleansing end to the meal. I sat at the table with the competition winners, Raymond Blanc and Jamie Cullum. Jamie was really engaging, taking much time and trouble to find out about everyone at the table. He has a real interest in people which I found endearing, and not what I expected from a celebrity performer. Raymond Blanc, a larger than life character, was also very entertaining company, and his passion about food was palpable. We had full and frank discussion about the UK food scene between one course or another. Music, great food and wine, and good company are what Martell's Very Special Nights are all about. The three days I spent at the Chateau de Chanteloup were among the most special and educational I have had in years, and I came away with great respect for Martell, the oldest of the Cognac houses. Not to mention a taste for the Cognacs themselves! Having drunk quite a bit of Cognac on this trip, I was surprised to feel completely clear-headed every morning - as someone explained to me when I commented on this, "the secret is that after a meal, you are moving from grape (wine) to grape (cognac), you don't want to mix your grapes and grains, do you?". Of course not! This summer, I'm planning to have a few Martell Sidecars in the garden, so why don't you join me? See the competition below for the chance to win one of five bottles of Martell VS. If you would like to visit the Martell Distilleries and have a tasting of its Cognacs on your next visit to Cognac, visit the Martell website here for more information. For a chance to win 1 of 5 bottles of Martell VS, all you need to do is leave a comment with your NAME and E-MAIL address as MrBloggs(at)gmail(dot)com by midday on Friday, the 9th August 2013. The 5 lucky winners will be randomly selected using random.org and their name will be announced via Twitter (follow @thelondonfoodie) at 1pm on that same day. To increase your chances of winning (every tweet/retweet to @thelondonfoodie using #MartellVerySpecialNights will count as an additional entry - up to 1 tweet per follower), follow and tweet me on @thelondonfoodie by midday on Friday, the 9th August 2013. If you do not use Twitter, I will also be publishing the winner's name here on Saturday, the 10th August 2013. Thank you for all the participants - the winners of this competition, randomly selected via random.org, are entries 3 (Natasha Claxton), 4 (Cristian D), 7 (Jenn), 15 (Holytshirt) and 19 (James Ramsden). Amazing pictures as always! The Paradis cellar sounds like heaven. Looks lovely. It'd be good to try some baking recipes with the cognac. Wonderful blog and thank you to the someone who explained why wine to cognac has you clear-headed the next day. Of course, makes a lot of sense when you think about it! It all looks amazing and I love Martell! Amazing! Mine and my dad's favourite! What an amazing experience and what a great write-up Luiz! I would love to win a bottle of Martell VS Cognac. What a stunning night! It looked like such a treat to be there! I'd love to win a bottle of that! What a fantastic experience! Sill need to find the cognac girl in me... so I would have loved to be there. Beautiful photos (love, LOVE the bambies)!